Hickenlooper also noted at the meeting with sheriffs that because a staffer “made a commitment,” he felt compelled to sign the magazine limit. Let’s try to unwind that logic there: Hickenlooper felt compelled to sign a piece of legislation because a staffer (still unnamed) made a commitment to someone (still unknown) somewhere at some time (both also unknown) that Hickenlooper would sign the legislation, but only because Hickenlooper told that staffer to do so; only, he can’t remember which one now. You say that village burned itself to the ground Mr. Viking? Well, we would doubt it, but if you say so, seems legit to us. How novel, actually wanting a politician to back-up the assertions they make. In a June 20 interview with Fox 31 Denver, Hickenlooper said he was being “candid” when he spoke to the sheriffs and that he didn’t know he was being recorded. “…Except now, when I wouldn’t tell you about that staff member I threw under the bus, because to be candid would be sharing that with you. So, when I said ‘all the time,’ I meant not really ‘all the time.’ And when I said ‘candid,’ I meant not really candid whatsoever.” So concludes the Peak‘s lesson in Hick-speak 101. You want to see how Hick really knows he’s in trouble? Yep, PeakNation™, that was a pivot! Classic politician in crisis 101: if the topic isn’t good for you, try to pivot to one that is. 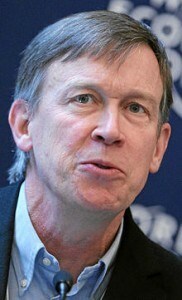 What the government’s response has to do with guns or Hickenlooper’s comments to the sheriffs, we haven’t a clue. But, maybe the unnamed staffer could explain it to us if we could ever track her down. And that Eli, is how real reporters do their job.